Fifty-five thousand people gathered at the weekend to watch Wladimir Klitschko render the once proud Cruiserweight Champion of the World, Jean Marc-Mormeck, even more ineffective than those with some foresight believed he’d prove when the fight was signed. Size is not the only currency in the heavyweight division, it is important to remember Jess Willard, at 6ft 6 inches and 235 pounds, was pounded to defeat by Jack Dempsey and later Primo Carnera who weighed 270 pounds and was of comparably lofty perspective when Max Baer inflicted a similar drubbing. At nearly 40 years of age, inactive for 15 months and struggling to stretch the tape even to six feet, Mormeck was however, spectacularly unqualified for the adventure he signed up for. Mormeck’s lack of credentials are indicative of a forlorn division and a new reality of failure and inactivity leading to opportunity. Even now, with the heavyweight scene almost entirely conquered by the erudite and charming brothers, should a heavyweight contender, qualified or otherwise, be allowed to remain inactive for 15 months between his last fight and his challenge for the title? Larry Holmes was considered retired when he fought Mike Tyson, and yet it was only 20 months since he’d lost to Michael Spinks. Joe Louis made a comeback of sorts, twice, fighting Billy Conn 18 months after Abe Simon and then a similar sabbatical following his two fights with Jersey Joe Walcott. Both Holmes and Louis were younger than Jean Marc-Mormeck. That this bout was made is embarrassing enough. That greater opposition was not voiced to the various sanctioning bodies edifying the spectacle with their baubles is equally worrying. Of course, the division has history of such folly. Dereck Chisora the most topical beneficiary. His challenge to Klitschko the Grey was ‘earned’ from defeats to Finn Robert Helenius and Tyson Fury, both saplings themselves, with just the pacifier of a six round tango with cruiser weight journeyman Remigijus Ziuasys to glue them together. Not that this plague of poor form started with Wladimir and Vitaly either. Andrew Golota, the Pole with the nut allergy, fought Lennox Lewis for the WBC title in 1997 having lost both of his preceding contests and then seven years later had three successive title shots without winning one of them against Chris Byrd, John Ruiz and Lamont Brewster. And that was a much richer period, in terms of competitive contenders, though nobody ventured that opinion at the time. Ahead, we likely have the prospect of Vitaly Klitschko facing David Haye; a fighter who lost his last fight to Klitschko the Younger, blamed a toe injury and then injured his own trainer with a camera tripod. And, lest we forget, will likely have been inactive for 12-18 months by any proposed fight night. Defeat and inactivity are the watch words for heavyweight contenders. 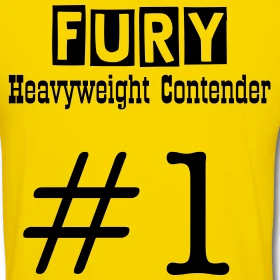 Which is regrettable given the fun and mayhem we would enjoy if Fury, Haye, Mitchell, Arreola, Chisora, Povetkin and Solis started fighting each other. They may even learn from the experience. And in doing so, vastly improve their prospects when their turn in the spotlight arrived. But tradition and common sense, like form and activity, are not popular currency in 2012. Warwick, thank you for your patronage. The contenders don’t seem in a huge rush to clash and the abundance of sanctioning bodies, diluted versions of the ‘title’ and the fact the market is now torn between America AND Europe tends to permits this lack of competition. You have the top 10 guys like Povetkin and Haye just holding steady waiting for the Klitschko’s to age or relying on bravado to claim shots rather then hunting down each other. And don’t get me started on the return of Hasim Rahman as mandatory for one of the organisations who claim to run boxing. Despite all this, the over-arching truth is, this is a weak era dominated by a duopoly which serves to undermine their respective achievement. You’ve said it. The sanctioning bodies have all but flushed a once proud sport down the dunny! I am afraid your appraisal seems to be spot on. There appears to be absolutely no one around who even starts to offer a plausible challenge to either of the Klitchkos. I do not recall the heavyweight picture being quite so dire. Not a White (or Black) Hope in sight! However, your final point is a very good one. Why don’t the top contenders fight each other thereby building both their profesional experience and their credibility? Back in the day circa 1950’s, that was how challengers established themselves as deserving of a title shot. I distinctly recall Eddie Machen and Zora Folley fighting each other twice when they were nos. ! & 2 respectively in the rankings. That Floyd Patterson fought neither of these very worthy contenders was a reflection of his penchant for avoiding any contender who seemed likely to gove him trouble. Remember Pete Rademacher or Roy Harris (of Cut n’ Shoot)?